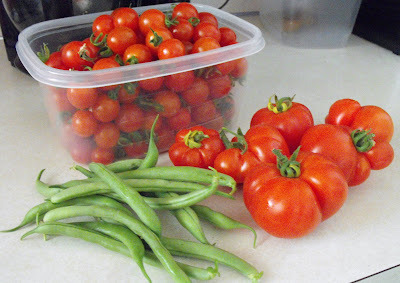 My slicing tomatoes are slowly ripening up, but it's not like I'm getting a significant quantity all at once. I am hoping to get enough to do a small batch of sauce. That is a lot! I love them and eat them out in the garden or else I roast them. I never thought to freeze them. The big tomatoes here are still solid green, I was just out looking at them. I put them in salsa without taking the skins off. I didn't notice the skins to be a problem. Maybe because they are thinner. You might want to try that. Hope it helps. I never tire of tomatoes. When we recently had a tomato glut, we had tomato juice, tomato jam, tomato sauce and tomato rice. I was going to say roast them for winter use! I see you are already doing that, uhm share with the neighbors! My Grandma would make them into juice, she was always canning. K~ I wish you were my neighbor too! Well, if you don't like them and your kids don't like them, maybe you can give them away, like others have already suggested. Nice photo!